Quick hit today, got some decent brush time in over the last couple days and laid in the base colors on the cloth and armour on the first batch of Acolytes and the Aberrants - they're starting to come into focus! I knew I wanted to do a slightly different scheme from the last go-around and settled on a yellow cloth and white armour. Went with some red spot colors on them as well to tie in with the reds on the Purestrains. 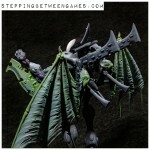 Pressed on with the Aberrants as well, this pic shows the oily metallic rather well. Got a few more colors to go on the models themselves, then it's just a matter of finishing off the bases. So far so good! 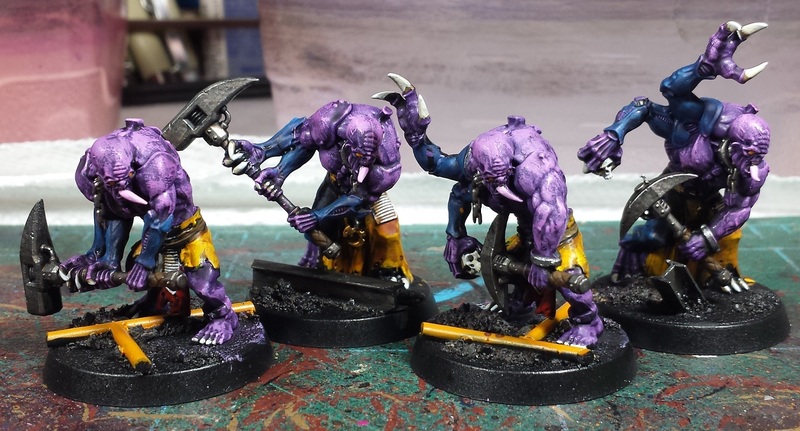 Great looking so far, nice traditional Space Hulk purple and fresh with the yellow cloth. Nice. Love the sulfur yellow. Not so sold on the stark yellow on the base-pipes as from afar they are clashing with the yellow on the figs themselves. But I'm guessing there's plenty of work to be done yet. @#2501: Thanks! Wanted to keep it grimy. Beautiful work, I'm inspired to start building my own cult.